Julia Gaffield interviewed by Reena Goldthree, for Black Perspectives, The African American Intellectual History Society Blog, October 10, 2016. Damien Cave, “Haiti’s Founding Document Found in London,” The New York Times, 1 April 2010. 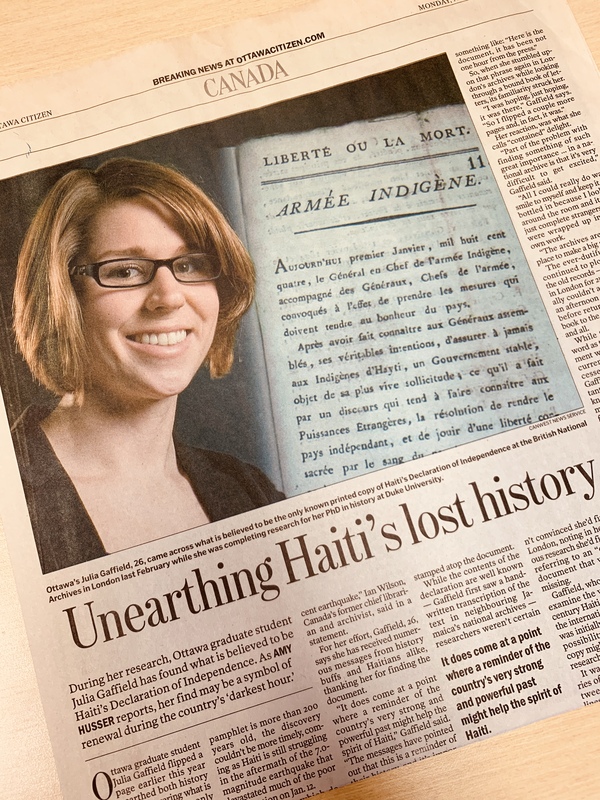 Siri Agrell, “Grad student uncovers Haiti’s Declaration of Independence,” The Globe and Mail, 1 April 2010. “Rediscovering Haiti’s Declaration of Independence,” Duke University. Interview with Marco Werman on PRI’s “The World” from BBC, PRI, and WGBH, 1 April 2010. Interview with Carol Off and Barbara Budd on “As it Happens” on CBC Radio 1, 1 April 2010, (part one). Interview with Frank Stasio, “Discovering Haiti’s Declaration of Independence,” The State of Things, North Carolina Public Radio. August 2010.